In 1954, the United States Supreme Court issued its landmark Brown v. Board of Education of Topeka decision, which ruled the segregation of American public schools unconstitutional. That same year, in Harford County, Maryland, Harry S. Johnson was born. Fifty years later, Johnson, a Litigation Partner in the Baltimore office of Whiteford | Taylor | Preston, LLP, would go on to become the first African-American President of the Maryland State Bar Association (MSBA). Johnson, who joined the Maryland Bar in November 1979, recalled the many watershed moments for minorities in the legal profession during his lifetime – the appointment of Judge Harry A. Cole, the first African-American to serve on the Court of Appeals of Maryland, in 1977; the appointment of the high court’s first African-American Chief Judge, the Honorable Robert M. Bell, nearly two decades later; and the election of the first woman of color to lead the MSBA, Past President Judge Pamila J. Brown, in 2015, to name but a few – during his keynote address at MSBA’s inaugural Diversity & Inclusion Conference on Thursday, March 21, 2019, at the University of Baltimore Merrick School of Business. Johnson also cited the creation of specialty bars that have given greater voice to historically underrepresented lawyer groups like women, Hispanics, Asians, Native Americans, and the LGBTQ communities. Such efforts to that end on the part of the MSBA have included the creation of the Diversity & Inclusion Committee, which hosted the conference, during Brown’s year as President. Brown stressed the importance of such a forum, especially in today’s sociopolitical climate. Contextualizing both past and present, the conference cast a wider eye toward the future with panel discussions such as “Change Comes to Washington”, “Diversity is Good for Business”, “We’ve Been There Before”, and “Views of Diversity and Inclusion from the Bench”, each drawing upon the experience and unflinching insight of key members of the bar and bench. 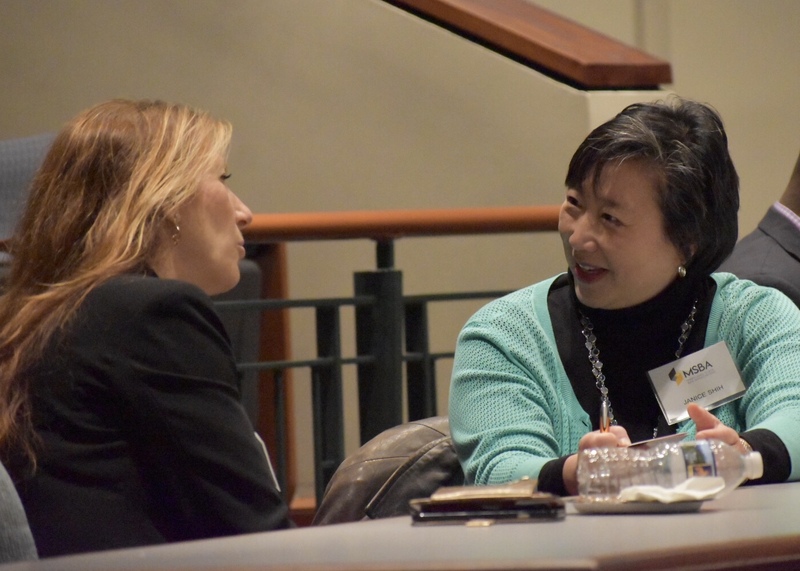 The importance of maintaining a strong support network of family and friends, as well as bar association colleagues, was a common thread for many of the panelists, virtually all of whom related firsthand encounters with bigotry, implicit bias, racism, and sexism as well as matters involving gender identity, sexual orientation, disabilities, and other forms of discrimination throughout their legal careers. “This conference is both substantive and symbolic, and represents MSBA’s deep commitment to the promotion of diversity and inclusion within the legal profession,” said MSBA President Judge Keith R. Truffer. Later, the Diversity & Inclusion and Business Development Committees of the Young Lawyers Section co-sponsored a happy hour and scavenger hunt for conference attendees at Baltimore’s Waverly Brewing Company. Sponsoring Sections included Young Lawyers, Legal Education & Admission to the Bar, Administrative Law, Business Law, Estate & Trust Law, Alternative Dispute Resolution, and Solo & Small Practice, as well as the MSBA Membership Committee. Law firm sponsors included Pasternak & Fidis, P.C. ; Sonnier Legal & Consulting Group; Downs Collins, P.A. ; Law Offices of Elsa W. Smith, LLC; and the Basu Law Firm, LLC. Individual donors included the Honorable Michael W. Reed, Ken Besser, Dana Broughton, Robert Fontaine, Glendora Hughes, and Michelle Lipkowitz.